Accueil du site > Sujets de recherche > Neuro-physics: Theoretical approach and modeling of neuronal network cultures. Non linear interactions, information processing and cooperative phenomena underlie the ability of a neuronal network to perform biological computation. In the human brain, each of the 10^11 neurons are connected to a great number of other ones (about in average 7 000 per neuron) ; the signaling is both electrical (propagation of action potentials) and chemical (neurotransmitter release through synapses) and travels along axons in a single direction. Besides the investigation of the cerebral activity in vivo by means of electroencephalography (EEG), magnetoencephalography and Functional Nuclear Magnetic Resonance (NMR), in vitro reconstruction of neuronal networks has turned out to be a powerful tool in investigating fundamental questions about biological computation, mechanisms of cognition and neurodegenerative disorders. 1°/ How can the emergence of collective behaviors in neuronal networks be understood from a statistical physics point of view ? What can be extracted from a model with regards to network topology and neuronal activity ? 2°/ What is the nature of neuronal information processing ? What kind of computation do neuronal networks perform ? Are in vitro neuronal devices able to learn ? 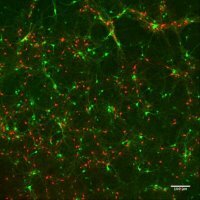 3°/ How do neuronal networks in vitro grow ? How can the directionality of axonal growth be understood and controlled ? Pascal Monceau, Stéphane Métens, Tanguy Fardet, Renaud Renault and Samuel Bottani, European Physical Journal Special Topics (2018) Neuronal devices : understanding neuronal cultures through percolation helps prepare for the next step. Dec. 2011-Avr. 2012, R. Renault, "Investigation of a quorum percolation model for neuronal networks". May-July 2013, N. Fossey, "Modelling of the collective behavior of neuronal networks : effects of thresholds disorder". May-July 2013, M. Boukhet, "Modelling of the properties of connected clusters in the framework of neuronal networks : quorum percolation." Jan-Mai 2014, M. Agamennone, "Modeling, simulation and study of two-dimensional dissociated neuronal cultures : growth process, topology, activity". Jan-Mai 2016, M. Ballandras, "Synchronization in neuronal networks". September 2012-October 2015, Renaud Renault, "Emergent design of neuronal devices". September 2015- , Tanguy Fardet, "Growth and activity of neural networks : emergence of non-trivial behaviours." 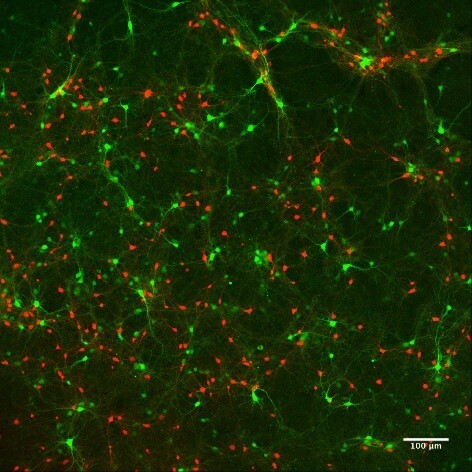 How do neuronal networks in vitro grow ? How can the directionality of axonal growth be understood and controlled ? How can the emergence of collective behaviors in neuronal networks be understood from a statistical physics point of view ? What can be extracted from a model with regards to network topology and neuronal activity ? What is the nature of neuronal information processing ? What kind of computation do neuronal networks perform ? Are in vitro neuronal devices able to learn ?